Toss orange all around your room like in this office---lampshades, flowers, and chairs all show off the crisp, creative color pairing it with antiqued white and creamy grays. Love pink? Pair it with orange! Orange and pink are a match made in color heaven. Wild orange chevron glams up an ultra-feminine space filled with pink, cream, and neutrals. 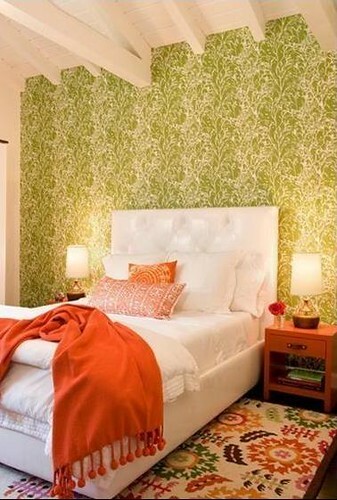 Orange in a snap: throw a quilt that features bright hues of orange on the foot of your bed. That was almost too easy! And it sure looks good! Feeling ambitious and courageous? 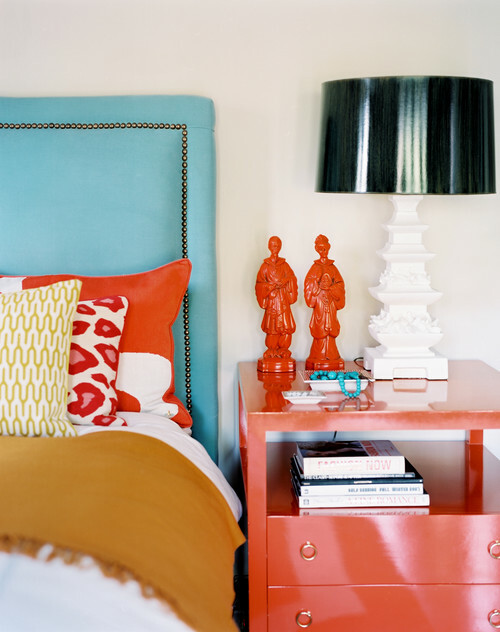 Spray paint your nightstand a bold orange. I love steely gray paired with warm orange. (It might give the classic gray + yellow gold combo a run for it's money, no?) Ideas to take from this room: Leave the permanent and large-scale things (walls, floor, furniture) as well as bedding and most accessories neutral. Then, add in punches of a color with easy-to-switch out objects like pillowcases and vases. Wrap a basic rectangular headboard in a fun colored fabric (try bedsheets!) for a fresh fix. I also love the floating nightstand that allows for a wicker storage ottoman to slide underneath. The easiest way to bring orange into your room without committing: switch out the curtains! Long orange curtain panels will bring a burst of energy into your space instantly! Don't you love just love this window? Perhaps you lean more toward cool blues and grays on the color wheel? 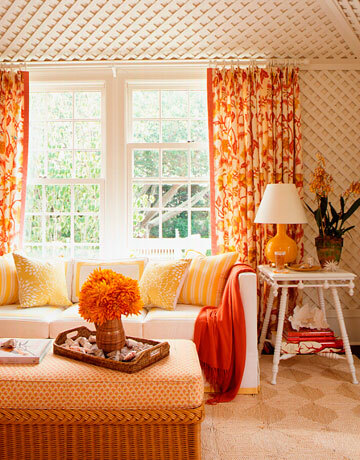 This room is a perfect example of how to bring in just enough orange to warm up the space without overwhelming you. For a low-dose of high-energy orange, stick to the darker, richer shades of orange. Throw pillows (in a delightful velvet) make orange luxurious. A small vase of flowers makes a big color impact, too. And once you've warmed up to our friend Orange, you might feel like upholstering something more permanent... like a chair, or in this case a bench. Keep your room to a neutral black and white color scheme and you'll be able to switch up the flavor in a cinch just by piling pillows onto the bed. 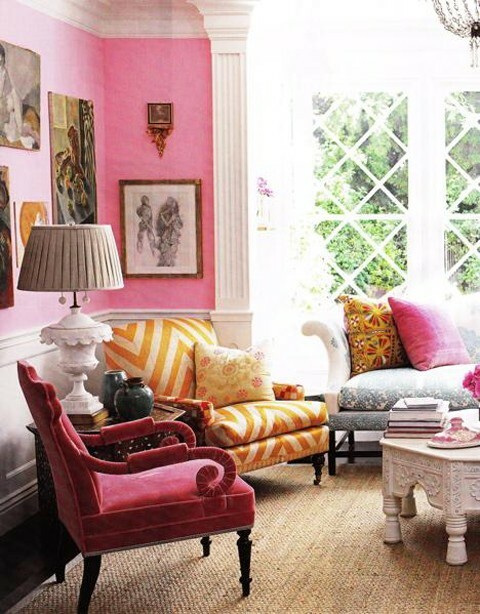 I love the delicious burst of color these pillows bring to this room. And it's repeated in details throughout the room... like that bottle next to the window. Afraid that orange won't work in your current color scheme? Puh-leeease. This room full of beige and blue goes to show that orange can be brought in just about anywhere. Pick a patterned pillow that brings together orange with a strong neutral you've decorated with in the room... for example, in this room the pillows incorporate orange along with the cream and beige you see all over the room. A bowl of peaches and book bring in the color in tiny details. Orange plus lime green and white is retro, modern and oh-so-very fresh. Since the orange is brought in through a throw, pillows, rug, and warm-toned wooden nightstand... it could be switched out for a different tone quickly and easily. But really... why mess with beauty? LOVE orange? I've talked a lot about bringing orange into your room through easy-to-switch out accessories and such, but you may love orange too much to do that. So go ahead and saturate your room in it! This room has golden orange, tangerine, and red orange all over the place---ottoman cushion, flowers, blanket, pillows, lamp base, curtains, books. Here's another room for you orange-lovers. Instead of making everything in your room orange, use orange in large scale ways. Big art. Big chairs. It's almost the same effect as painting the room orange. ...Speaking of painting a room orange! I'm kind of in love with this super eclectic orange room. I love how the beautiful blue crushed velvet sofa stands out against the vibrant orange wall. And lastly, let's go back to pairing gray with orange. I'm lusting over the charcoal gray walls in this room. 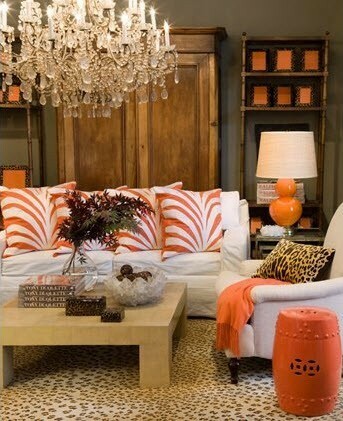 Love the white furniture and orange zebra-ish print pillows. But mostly: that chandelier! Lovely! When I lived at home my freshman year of college, my bedroom was painted orange for about a year. I looooved it. Would you ever paint your entire room orange? Would you rather bring orange into your space in small, easy-to-switch out doses? Or are you not a fan of orange at all? I love orange--it's so fun and bright! For my home/apartment, though, I prefer it in small doses. It's a little too bold for me to have it all over everything! Love the pops of mustard. It's one of the hottest colors for fall! Oh, that’s good and bad in a way. Anyways, thanks for sharing the same.